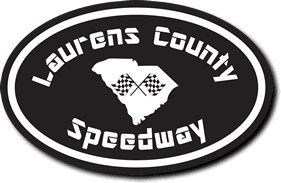 In a division that has been dominated by Laurens County Speedway stalwarts Chris Patterson and Mart Patterson, another familiar face – Dale Timms, making his first appearance at LCS this season – looked ready to take over the top spot, if only for a week. 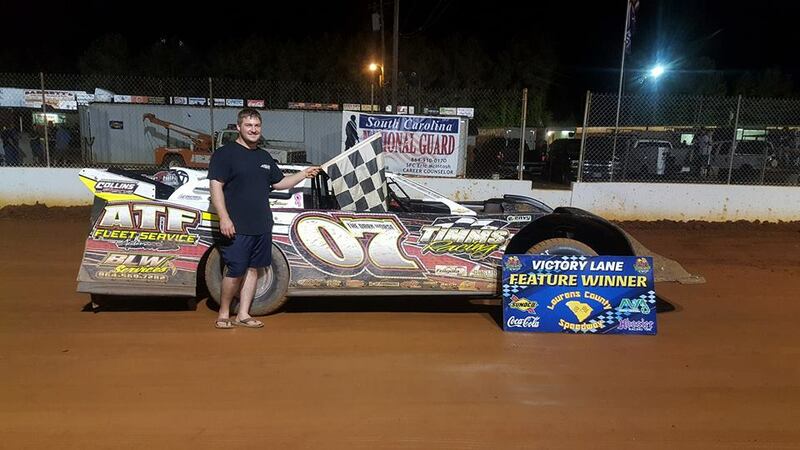 Timms didn’t disappoint, passing the p8 of Chris Patterson on the 11th lap of the race and holding on through lap traffic to take home the checkered flag in the 602 Crate main event, winning the $700 top prize. Chris Patterson was second, Mart Patterson was third, Butch Riddle was fourth and Brad Abercrombie was fifth. After a pair of attempted starts were cut short due to cautions, Chris Patterson grabbed the lead with Timms, who started on the inside of Row 2, getting by Mart Patterson for second place. The top three drivers quickly established themselves as the class of the main event, and as the race reached the halfway mark Chris Patterson held onto the top spot. But as the cars went through the second turn, Chris Patterson’s car went high through the second turn, giving Timms the chance to zip by underneath and take over the lead. Timms managed to fight off both Pattersons for the remainder of the race, even as the field caught up to the back end of the lead lap. Timms managed to weave his way through the lap traffic without being slowed up, and after he got past the last of the trailing cars Timms had enough to get to the finish line. Limited: Frank Coates opened a sizable lead before having to hold on to win the main event over Billy Rushton, who had won the previous week. Michael Smith finished third, his lowest finish of the season. Coates’ night started strong as he turned a sub-15 second lap in hot laps. He kept the momentum going by winning the heat race, and on the start of the main event pulled out to a lead. Rushton stuck around with Coates during the early going, but Coates pulled out to a healthy lead of more than 2 seconds with seven laps to go. But as the laps ticked down, Rushton started turning quicker laps than Coates, and he started to build hope for a late comeback that could’ve seen him take the checkered flag at the end. Coates, though, managed to hold onto the top spot and took the top spot. Monster-Minis: Larry Teal took home his second straight main event victory, pulling away to an easy decision after the second restart. Michael Hicks was second and Nick Coleman third. Teal took the lead on the start of the main, taking advantage of his pole position that he earned by winning the heat race. Right from the second-lap restart, though, it became apparent that Teal was the most dominant driver in the division, and no matter what anyone hoped Teal was not going to be denied as he rolled to Victory Lane. Thunder Bombers: Dylan Chappell took home the victory in the main event, ending Bobby Tucker’s streak of main-event victories at two. Tucker was second, with Casey Lawson third. Tucker had the lead at the start, but it didn’t last long as Chappell was able to make a pass on the first lap and grabbed the top spot. Tucker held close in second place for a time but was never able to make a run in the early going to recapture the lead, and Tucker ended up falling back one more spot on the fifth lap as Darren Fowler took over the spot. Fowler, however, couldn’t hold onto second as his car slowed on the seventh lap and had to retire, allowing Tucker to take back second. Chappell, however, stayed out of the fray and pulled away to win a caution-free race. FWD: Andrew Patterson made his starting spot on the pole stand up as he won the main event. Grant Burton finished second and Jason Bishop took third. Patterson used a good push through the starting zone to grab the lead on the opening lap, with Spud Ammons following in second and Bobby Anthony third, but Ammons’ night proved to be a short one when fire appeared from under his car. Ammons was okay, but his night was over after the incident. On the restart, Patterson again used a good start to maintain the lead, but had to shake off Burton’s best efforts early before building a lead that proved too big for Burton to overcome. 604 Crate: Ray Storay was not to be denied in the main event, opening a safe lead from the start and easing home with the main event victory. James Plemmons was second and Terry Bullard was third. Storay held a lead as big as 3.5 seconds toward the end of the main event, with Plemmons facing an early challenge by Bullard for second place that eventually faded away as Plemmons separated himself from the veteran Bullard – all while Storay opened a lead that proved insurmountable. 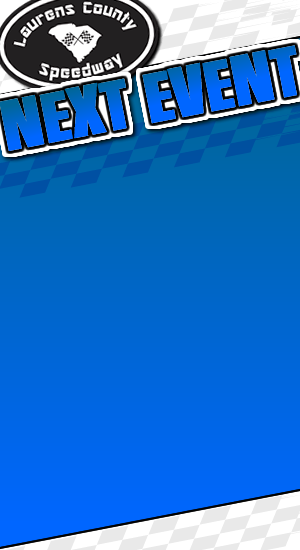 Note: This Saturday will feature the Sprint Division at the track, along with the usual six divisions.